It’s my birthday. I’m thirty five. This is a very stable and confident sounding number. It’s also halfway to seventy. My maternal grandmother who is ninety one tells me that 70 is young. I appreciate the encouragement. I’ve always been the kind of person who thrives on atta girls. I had a report card one time that actually said “needs too much encouragement. Can’t work without outside approval”. People say that those with a healthy self esteem don’t need others to prop them up. While I understand this theory, I actually think this is completely ridiculous. Last night, running around the track in the dark I totally would have quit when I got a stomach ache had it not been for the amazing marathon runner beside me urging me on. Encouragement keeps us moving foward. It can keep us holding on when we don’t see a way through the dark. Growing up, I loved the days at school where mom had put a note in my lunch box. I got a note from her today. I’m blessed today with facebook messages, texts, emails and I even got a fax. This kind of encouragement just makes me smile. I was missing my paternal grandmother today. She died on New Years day, just nine months ago. 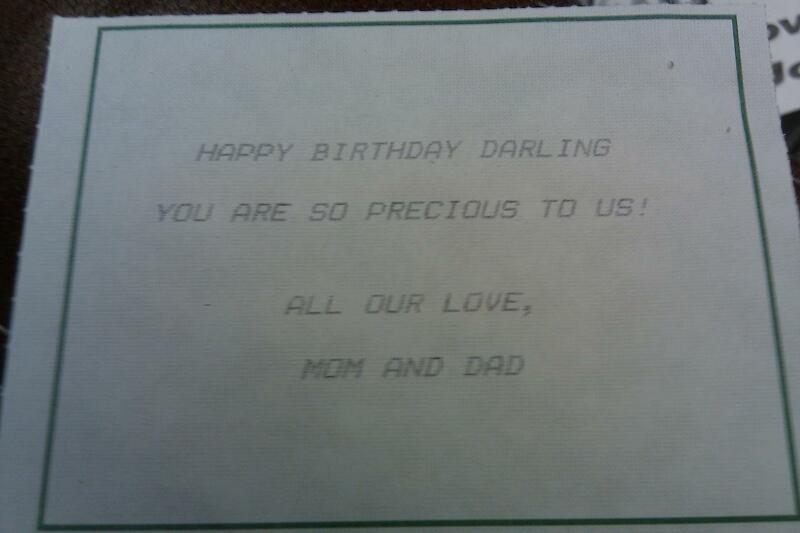 She never missed a single birthday my entire life. She also never skipped sending thank you notes or congratulations cards. 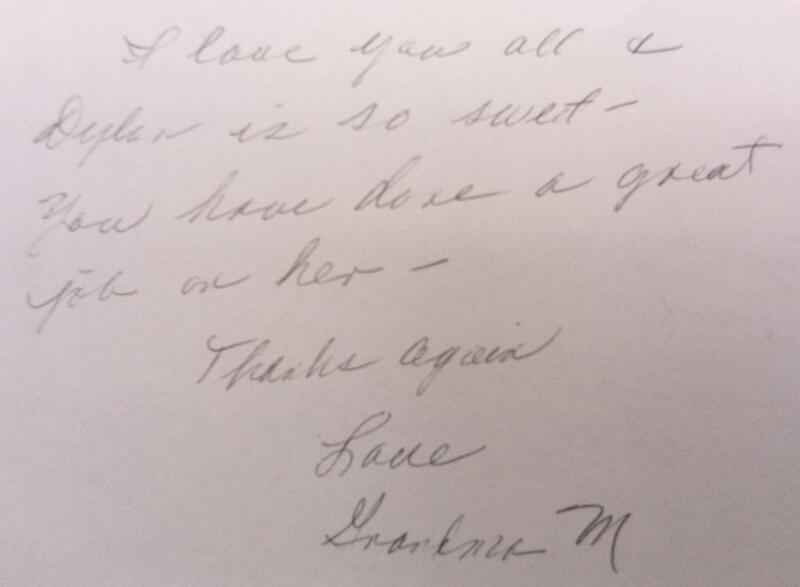 I’m sure my love for the written note comes from Grandma. This note sits above my desk. When I’m frustrated with parenting or feel like I’ve blown it, I read this note and remember I come from good stuff. 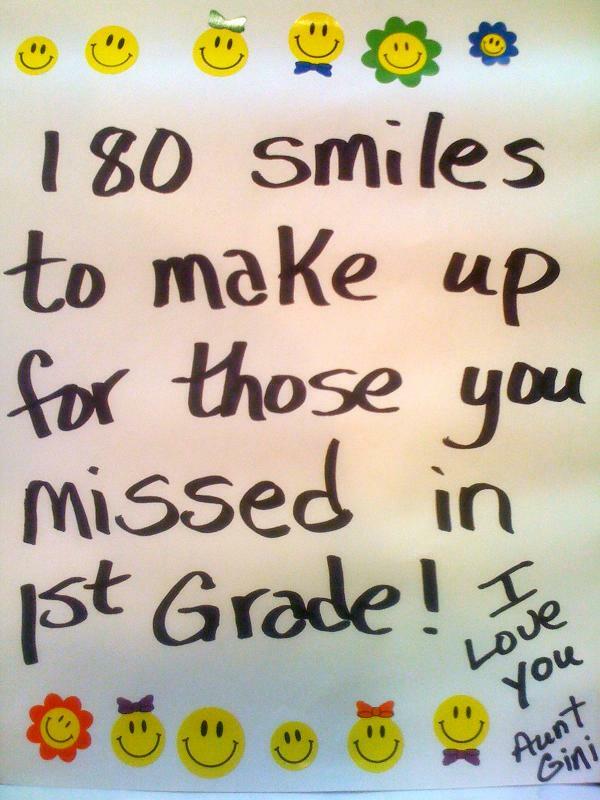 I blogged last week about my teacher who gave me frowns all year. This note showed up with a whole page of sticker smiley faces attached. 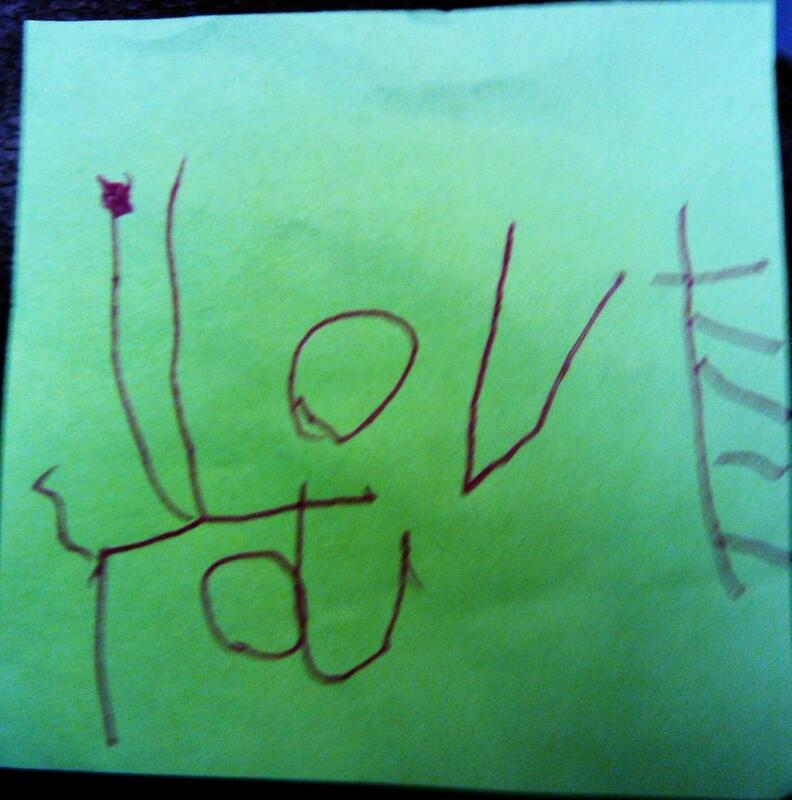 My daughter gave me one of my all time favorite encouragement notes. It really does come down to that. I love you. That’s what people want to know. Take a minute today, write a note. Tell someone you love them. Encourage them on. My 91 year old grandmother has alzheimers. She is doing well. Still knows who we are. Still tells us she loves us. We’ve been writing her notes. Someday she’s going to hear the the best words of encouragement ever spoken. Word from her Creator. “Well Done, Good and Faithful Servant”. Thanks to Vickie C. for sending with us daily encouragement notes with Bible verses and a candy. It has been a huge help to get a tiny taste of home and some food for our hearts. A box of raisins with a note that says “We’re Raisin good kids”. One day we had an extra starburst (You are a Star Volunteer) which we gave to our guard at the guest house. He jumped up and down and said SUGAR. ITS GOOD ITS GOOD.